Windows 10 is expected to see the light of day during the upcoming summer, and just like Microsoft said during the January 21 event at its headquarters in Redmond, the new operating system will be offered as a free upgrade within the first year after launch to those who run Windows 7 or 8.1 on their PCs. 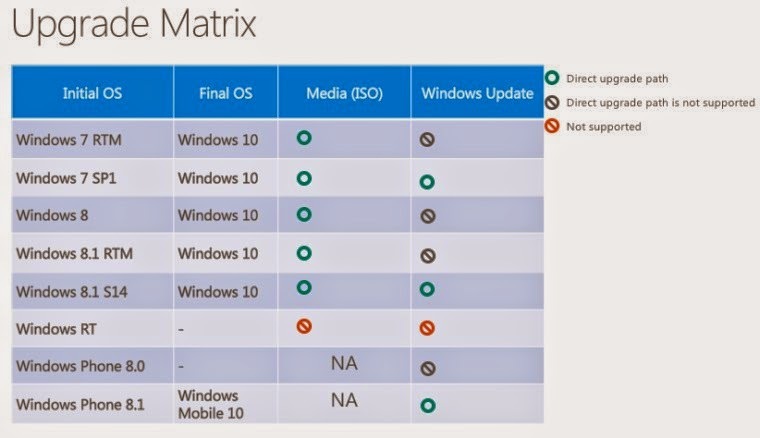 But as suggested in a slide presented by Terry Myerson, head of the OS unit at Microsoft, at WinHEC in China, the upgrade path to Windows 10 will be supported not only through the built-in Windows Update (as is the case right now for the Windows Insider program) but also with stand-alone ISOs that allow users to perform a clean install of the OS. According to this slide, Windows 7 RTM and SP1, Windows 8, 8.1 RTM, and 8.1 S14 will support upgrade ISOs, while Windows 7 SP1 and Windows 8.1 S14 (which is actually a fully updated version of 8.1) will also work with Windows Update. Surprisingly, Windows RT doesn't seem to support any of the two, which is pretty weird, given the fact that Microsoft has already confirmed that some Windows 10 features will also be offered to devices running the tablet-oriented operating system. Windows Phone users will have to update to 8.1 to get Windows 10, and the new operating system will obviously be deployed through the standard update feature.